It's hard to find cool clothes for kids in México, even harder to find some that are actualy made in Mexico. I recently found Babylon Baby. They make the coolest t-shirts in sizes 6 months to 6 years. 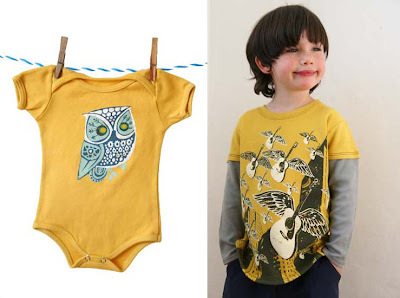 Their designs like Antifolk (inspired by NYC Antifolk music movement) and Groovy 70's Owl pictured here, and the very retro colors they use are a joy to see on kids. Their shirts are hand silk-screened and then dyed for a vintage look and feel, made from organic cotton they are really cozy and soft. Babylon Baby is a division of A Mano Trading Company (www.amanotrading.com) which is based in Sonoma, California and Mexico City. Their products are locally produced, Fair Trade, and Green. Like they say: "Small is good. Small people, small world, small planet". Visit their website www.babylonbaby.com and check out the song, I love it!